“Two-thirds of the way through this trilogy of new one-act operas at the Edinburgh International Festival, something operatic was missing. Then, with Ghost Patrol, the “something operatic” kicked in – big time. 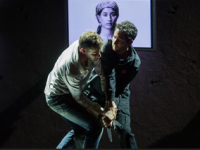 Stuart MacRae’s three-hander about the scars of war, to a libretto by Louise Welsh, does everything modern opera is supposed do: it asks questions, stirs the imagination, challenges complacency, grabs the heart. Oh, and it renews the art form, too. You come out feeling different – about love, life and death. And yet, despite such complexity of thought and feeling, MacRae and Welsh make opera seem simple: they get the essentials right. So it is good to report that Ghost Patrol moves to Glasgow and London over the coming month, before touring Wales. It deserves to go further. “In Ghost Patrol MacRae uses the same palette and an equally sparse and punchy libretto, but opts for close-knit musical argument and a constantly simmering orchestral style, using electronics, pre-recorded chorus and inventive aural effects: violins in eerie, double-stopped harmonics, the double bass creating percussive menace by bouncing the wood of his bow. You can hear Birtwistle’s influence in the high woodwind laments, but more as homage than imitation. The plot explores loyalty and betrayal via two ex-soldiers with a shared secret. A thief in the night, Sam (Nicholas Sharratt), breaks into a gastropub, only to be confronted by Alasdair (James McOran-Campbell) whom he recognises – as well you might, given his striking near nakedness – as his former commanding officer. Sam falls for Alasdair’s girlfriend Vicki (Jane Harrington). The past catches up, fatefully. Her folk-like threnody about a girl mourning the loss of her menfolk shot dead by soldiers had powerful expression. The cast here, too, was strong. “Crisply staged by Matthew Richardson, the piece benefits from the committed performances of Jane Harrington, Nicholas Sharratt and James McOran-Campbell, the latter mysteriously obliged to spend an unwarranted amount of time wearing nothing but his underpants. “Slightly overlong, but wracking up the intensity, Stuart MacRae and Louise Welsh’s Ghost Patrol is set in the bar of a military town after some future war. From the opening fight – expertly directed by Raymond Short – where bar owner Alasdair (James McOran-Campbell) discovers thief Sam (Nicholas Sharratt) was in his platoon when they were both in the army, there is a sense of foreboding. If McOran-Campbell and Sharratt quickly create a whole history of friendship and camaraderie between Alasdair and Sam, Jane Harrington as Alasdair’s girlfriend Vicki foretells the whole plot with one flaming glance at Sam. She creates assumptions which director Matthew Richardson then plays with and subverts to telling and, ultimately, heart-rending effect. “Stuart MacCrae and Louise Welsh’s Ghost Patrol proved a more-even creation, in which words, direction and score always worked together. Snappy video footage and tape effects enhanced the slick production. Former army sergeant Sam, now sleeping rough, unknowingly breaks into the bar of his former commander, Alasdair, and is invited to stay. He is haunted by their shared memories of combat, which his public-school brat of a senior had suppressed. There was genuine camaraderie between the two, and electric hatred by the end. The casting was excellent. MacCrae’s music sparkles like broken glass and bubbles like lava. As the tension mounted, clarinets screamed high in their registers. He matched Welsh’s claustrophobic fascination with the horrors of war, through militaristic effects from the percussion. Although more successful as an entity than In the Locked Room, Ghost Patrol poses more challenges to audiences. MacCrae’s music is far more ‘difficult’ than that of Watkins, often discordant and sometimes unpleasant, intentionally so. Sam’s night of terror, complete with taped voices and newsreel footage, was genuinely, deliciously terrifying.